Kiwi Shane van Gisbergen scored a home win in an intense opening leg of the ITM Auckland SuperSprint that spelt disaster for two title contenders. Forecast rain that officials feared would make racing impossible on the partially-resurfaced circuit held out, although light drops in the closing stages added to the drama. Van Gisbergen eventually led home Mark Winterbottom, Scott McLaughlin and Jamie Whincup after the former pair jumped their two rivals in a Safety Car-induced second round of stops. Disaster struck title contenders Chaz Mostert and Fabian Coulthard, in a late-race, multi-car fracas exiting the Turn 8 hairpin. It resulted in a flip for the Shell Ford and a penalty for Mostert, who triggered the drama with a bump on David Reynolds. The results thrust van Gisbergen ahead of Mostert and to within 159 points of Whincup in the title fight, the latter now leading McLaughlin by 18 and Coulthard by 137. 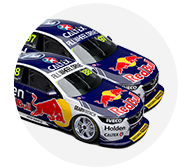 “We got a bit lucky with the Safety Car but it hurt us at Bathurst like that… it goes both ways,” said van Gisbergen. “It’s just awesome. I had to save a bit of fuel so I just backed up to them and tried to overheat their tyres. Whincup had made the best of the starts to lead polesitter Cam Waters and van Gisbergen, who leapt from sixth on the grid to run third. McLaughlin survived a touch from Tim Slade at Turn 1 to sit fifth behind Winterbottom before an early first round of stops, with van Gisbergen among the first in on lap 10. By the time all the leaders had pitted, Whincup led McLaughlin – who had taken on less fuel than his nearest rivals – van Gisbergen, Winterbottom and Waters. An intense fight between Whincup and McLaughlin ensured and, on lap 18, flirted with disaster as the six-time champion edged his rival onto the grass at Turn 10. McLaughlin held onto the Shell Ford after a wild slide, the battle continuing with Whincup issued a bad sportsmanship flag. Whincup continued to soak up the pressure from a clearly faster McLaughlin before an off for James Courtney on lap 32 brought about an early second round of stops. 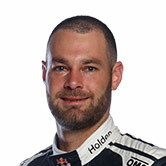 The top two pitted immediately and, with the Safety Car not called for some time, van Gisbergen and Winterbottom completed an extra lap before stopping. With Whincup and McLaughlin having to hesitate before being waved past the Safety Car on their outlap, van Gisbergen and Winterbottom emerged from their stops ahead. Shortly after the restart, McLaughlin finally took Whincup at the Turn 8 hairpin, returning serve on his rival by running him wide on the exit. The leaders held station as the skies grew ever threatening, with drivers starting to complain of light rain by lap 45 of the 70. Whincup stalked McLaughlin before surviving a major slide at Turn 1 on lap 52 that dropped him two seconds adrift. Dale Wood speared off at Turn 3 moments later, triggering a Safety Car that closed the field once again. Shortly after the restart, a dive from Mostert on Reynolds for fifth at the hairpin brought disaster for Coulthard’s title hopes. Having tagged Reynolds, Mostert snagged neutral and was slow on the exit, causing a bottleneck as the following cars of Jason Bright, Slade and Coulthard attempted to pass. Coulthard appeared to benefit greatly but failed to leave room for Reynolds on the right-hand side into the following corner, sending both spinning into the barriers. The Shell Ford went into the tyre barrier backwards before ending up on its roof, while Reynolds had a minor side-on impact and rejoined. That elevated Bright to fifth ahead of the final restart, which took place with six of the scheduled 70 laps remaining. Just three more laps would be run before the time certain cut-off, however, with van Gisbergen leading home Winterbottom by 0.8 seconds. Behind McLaughlin and Whincup, Bright held on for a season-best fifth ahead of Slade, Garth Tander, Craig Lowndes, Waters and Lee Holdsworth. Lowndes suffered an early spin after contact with Bright, while Waters went off on his own at Turn 3 just prior to Courtney’s error, destroying his chances of a top five result. Coulthard ended up as the race’s only retirement and now sits third in the standings, 137 adrift of leader Whincup, with Mostert now fifth and 210 behind after crossing the line 23rd.